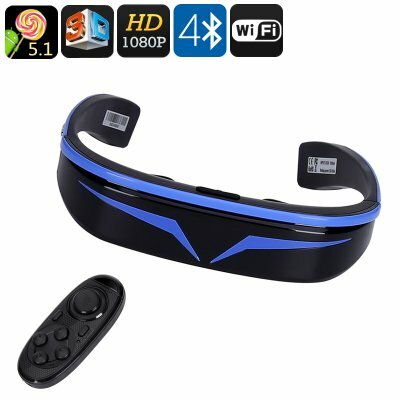 Successfully Added 3D Smart Video Glasses - 98 Inch Virtual Display, 1080P, Google Play, Quad Core CPU, WiFi, Bluetooth 4.0, 128GB External Memory to your Shopping Cart. Play games, brows the web, and enjoy all your favorite movies in stunning 2D and 3D quality with these amazing smart video glasses. Featuring an Android operating system, Quad-Core CPU, 1GB or RAM, and Mali-900MP processor these 3D video glasses provide more than merely a platform to watch your favorite movies on. Download all your favorite Apps and games through Google play straight on your smart glasses and enjoy them to the absolute most. Thanks the serious hardware these smart glasses are packing you are guaranteed to enjoy all your media files without dropping a frame. Its two LCD displays together portray a major 98 inch virtual screen. Watching movies on these futuristic looking glasses true provides you an authentic cinematic experience from the comfort of your own living room. With a supported video resolution up to 1080P you are ensured to enjoy all your media files to their fullest and in crystal clear quality. Equipped with a built-in 1800mAh rechargeable lithium battery these smart glasses offer up to four hours of continuous usage time, enough to enjoy an average movie from beginning to end, browse the web, or watch several episodes of your favorite series. Up to 128GB of additional external memory provides you with enough storage space to safe all your downloaded files, movies, games, and pictures. From now on you can leave your home with confidence as running out of entertainment will no longer be an issue. With its Wi-Fi connectivity these smart glasses allow you to browse the web and download all your favorite Apps, stream live video’s, and enjoy your games to the most. Supporting the possibilities to open and modify Office files even gives you the capability of checking presentations or proof reading official documents while out of office. Whether you are searching for a platform the browse the internet in the comfort of your own living room, enjoy all your favorite games and movies on the go, or are searching for a stylish way to stay connected with friends and family – these smart glasses are capable of meeting all your multi media and online demands. These 3D smart video glasses comes with a 12 months warranty, brought to you by the leader in 3D video glasses as well as wholesale electronic gadgets..
Arabic: - نظارات الفيديو الذكية 3D - Chinese Simplified: - 3D 智能视频眼镜 - Czech: - 3D Smart Video brýle - Dutch: - 3D Smart Video bril - French: - Lunettes 3D de vidéo intelligentes - German: - Intelligente 3D-Videobrille - Hebrew: - משקפיים 3D וידאו חכמה - Hindi: - 3 डी स्मार्ट वीडियो चश्मा - Hungarian: - 3D Smart Video szemüveg - Italian: - Occhiali 3D Video intelligenti - Japanese: - スマート 3 D のビデオ眼鏡 - Korean: - 스마트 3D 비디오 안경 - Malay: - Cermin mata 3D Video pintar - Norwegian Bokmål: - 3D Smart Video Briller - Romanian: - Ochelari 3D Smart pagina - Russian: - 3D очки смарт-видео - Spanish: - 3D gafas de vídeo inteligentes - Thai: - แว่นตาวิดีโอ 3D สมาร์ท - Turkish: - 3D akıllı Video gözlük - Vietnamese: - Kính Video 3D thông minh. My first thought about the 3D Glasses while doing a unboxing were these things are amazing. They have a solid but not a premium feel. The display is clear and bright for a LED but not a crisp as a OLED like my Galaxy Note Edge. The Android software is very light. It doesn't take up any extra memory than needed. Every thing worked right out of the box with no connection issues. I would recommend this a great buy.